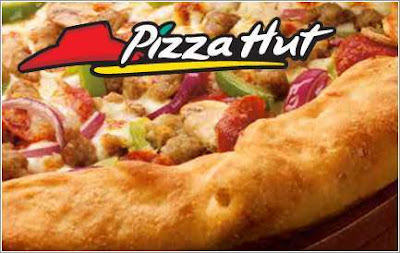 Weighty Matters: Breaking News: Official Health Check endorsement of Pizza Hut! Breaking News: Official Health Check endorsement of Pizza Hut! 'Cause nothing's healthier than taking your family to Pizza Hut for supper. "We know that many people want healthy choices when they dine out and having Health Check on the Pizza Hut menu helps them easily identify those healthy options,” says Julie Lau, Heart and Stroke Foundation registered dietitian for BC." While the options may be "less bad" than other options on Pizza Hut's menu, that doesn't make them "healthy", nor does it preclude other members of your family (or you) from ordering non-Check'ed items while they're there. Reading the small print on Pizza Hut's website one finds that a Health Check'ed serving of pizza is 2 slices and a Health Check'ed serving of pasta is 1/3 of a tray. A commenter the other day said that it's meant to help folks who've already made the decision to eat out, eat healthier and I suggested that'd be like the Canadian Lung Association endorsing "light" cigarettes to folks who've already made the decision to smoke.